The Greater Cleveland Aquarium, located in the Powerhouse on the west bank of the Flats, features more than one million gallons of water and marine life that ranges from local Lake Erie fishes to exotic fish from around the globe. 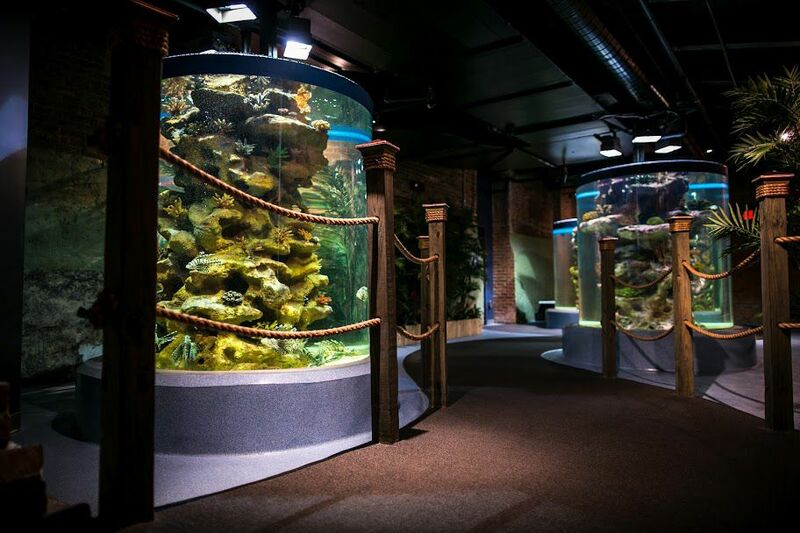 The Greater Cleveland Aquarium features 40 tanks of fish and aquatic animals and plants in 10 galleries. Central to the museum is an exhibit dedicated to the marine life of Ohio's rivers, lakes and streams. Other exhibits include "Weird and Wonderful," which is housed in the old coal tunnels of the Powerhouse; "Coastal Zone," which offers visitors a chance to touch a ray, starfish or even a shark; and "The Shark Tank," which houses a variety of fish and other sea creatures, mainly from the Florida coast. Facilities at the Cleveland Aquarium include a gift shop and a cafe that serves pizzas, sandwiches, salads and snacks. The cafe i s open until 3:30 p.m. during the week and until 4:30 p,m. on weekends. The entire aquarium facility is wheelchair accessible. Please note: the Aquarium now permits strollers inside the exhibit area. The Greater Cleveland Aquarium is open daily from 10am to 5pm. The facility is closed on Thanksgiving Day and Christmas Day. Admission (2016 pricing) to the Greater Cleveland Aquarium is $17.95 for adults, $17.95 for seniors (60 and older) and military, and $13.95 for children ages 2-12. Children under 2 are admitted free. (Unlike many area attractions, the best prices are available at the Aquarium box office; online tickets are $2 higher for adults.) There are also annual passes and family passes available. Parking is $3 Monday through Friday and $6 Saturday and $5 on Sunday. GCA pass holders park for free. The Greater Cleveland Aquarium is located near several downtown Cleveland hotels. Among these are Renaissance Cleveland (check rates), the Ritz Carlton (check rates), and the Marriott Key Center (check rates). For less expensive accommodations, try one of the hotels at the I-77/Rockside Road corridor, such as the Holiday Inn Independence (check rates).